The Cameo range is clean and fresh with a touch of femininity. Complete your range with the Cameo stool. This dressing table stool is neat and compact. Perfectly proportioned to slip under your dressing table when not in use, keeping your bedroom streamlined and clutter free. The stool sits you at the ideal position at your dresser to clearly view your mirror. The Cameo stool is a new take on the traditional shaker style. Finished in a fresh and neutral stone lacquer this Cameo stool has great versatility. 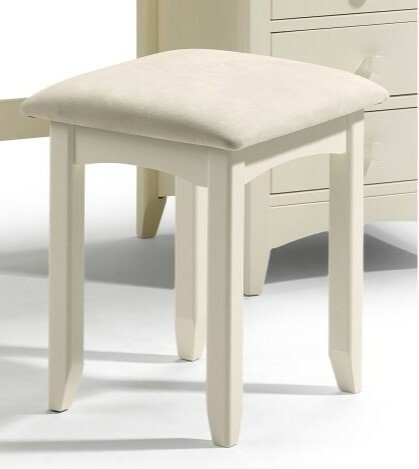 The stool top is smooth faux suede also in a neutral stone colour. 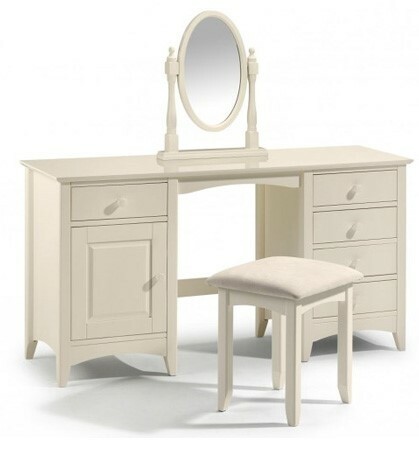 Coordinating perfectly with the Cameo dresser, however due to its versatile look it can be added to an existing dressing set. The stool is constructed from MDF and pine which has then been coated with an off white paint. The seat pad is soft faux suede. It’s very easy to maintain the new look of your Cameo stool. A wipe over with a dry cloth or a damp cloth for tougher marks should do the trick. For the faux suede top use a suede brush for marks. Treat spills on suede as soon as possible by lightly blotting with a clean, damp cloth. The Cameo stool does require assembly however it is a small item, assembly will be fairly minimal. It is possible for one person to assemble this item.